The Minimally Invasive Surgery Centre, partner of NANBIOSIS, has developed a software platform to apply mixed reality to medical training and surgical assistance. This will enable the creation of new and more realistic scenarios for medical training and improve surgical results. 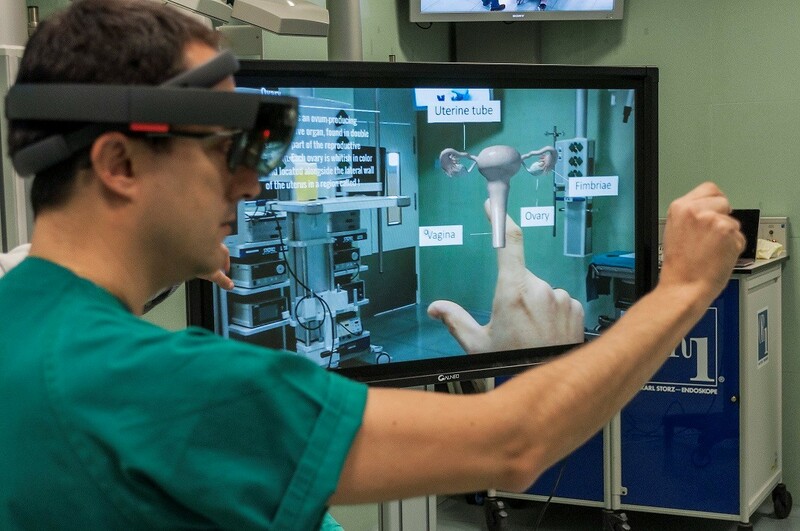 The Minimally Invasive Surgery Centre (CCMIJU) uses mixed reality technology, by means of the Microsoft’s HoloLens glasses, to help train future healthcare professionals and provide an assistance tool for complex surgeries. The institution located in Cáceres has begun using the mixed reality glasses, whose technology combines virtual reality with augmented reality, with the aim of developing, on the one hand, a medical training platform for the anatomy of the pelvic floor, and on the other, a tool for surgical assistance during renal tumor resection procedures. The use of this technology will benefit both medical students and residents, as well as surgeons. For the former, a software application has been developed and integrated in the HoloLens glasses, that will allow them to visualize and interact with the human anatomy of the pelvis -with and without pathologies- both at muscular, vascular, bone and nervous systems levels. This will facilitate its translation to the real medical practice. As for the surgeons, this technology will provide access to preoperative studies and real 3D models of the patient in the form of virtual holograms, facilitating the surgical planning and assistance during the abovementioned renal interventions. The software, developed entirely at the CCMIJU, is in its validation phase in operating rooms. For the first time, and using their own 3D anatomical models, this type of technology is being used for training on the pelvic floor anatomy and for surgical assistance in renal tumor resections. This R&D line arises from public-private cooperation. The CCMIJU’s team, led by Dr. Francisco Miguel Sánchez Margallo, Scientific Director of this institution, consists of engineers and staff of the Interactive 3D Unit of the Centre who work together with the company CIBEX on the development of new surgical applications. This alliance will enable healthcare professionals to use this emerging technology in challenging surgical interventions and carry out more effective and safe surgeries. Pablo Laguna, Scientific Director of NANBIOSIS Unit 27, has recently been appointed as a select member (IEEE fellow) of the Institute of Electrical and Electronics Engineers within the society of Medical Engineering and Biology -IEEE-EMBS-. The grade of Fellow recognizes unusual distinction in the profession and is conferred only by invitation of the IEEE Board of Directors upon a person with an extraordinary record of accomplishments in any of IEEE’s designated fields of interest, in this case, Dr. Laguna is recognized for his contributions to cardiac biomedical signal processing. The IEEE-EMBSis the world’s largest international society of biomedical engineers. The 11,000 members of the organization reside in some 97 countries around the world. EMBS provides its members access to people, information, ideas and opinions that are shaping one of the fastest growing fields in science. 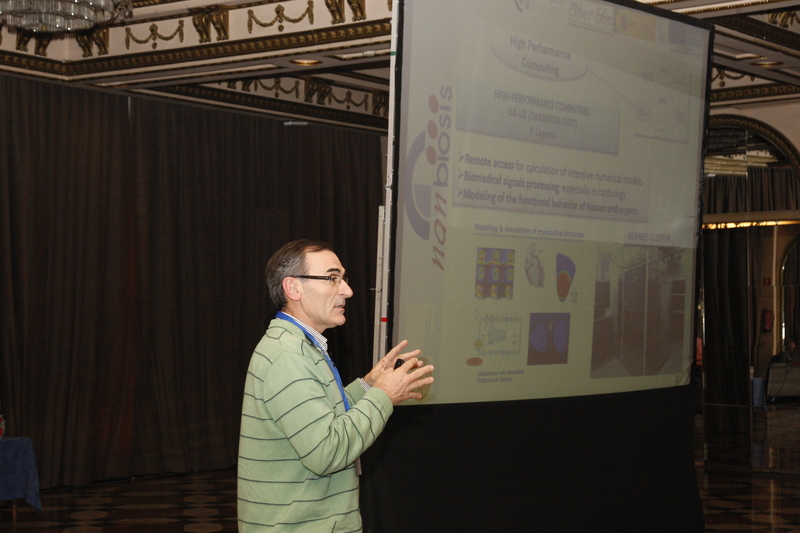 Pablo Laguna is Professor of Signal Theory and Communications at the School of Engineering and Architecture (EINA) and group leader of the CIBER-BBN and University of Zaragoza research group BSICoS . His work focuses on the search of non-invasive indexes to predict the risk of arrhythmias, the modeling and simulation of cardiac electrophysiology, the evaluation and quantification of the activity of the autonomic nervous system and the processing and characterization of biomedical signals in respiratory pathologies. He has been Scientific Director of the CIBER-BBN from 2011 to 2015. 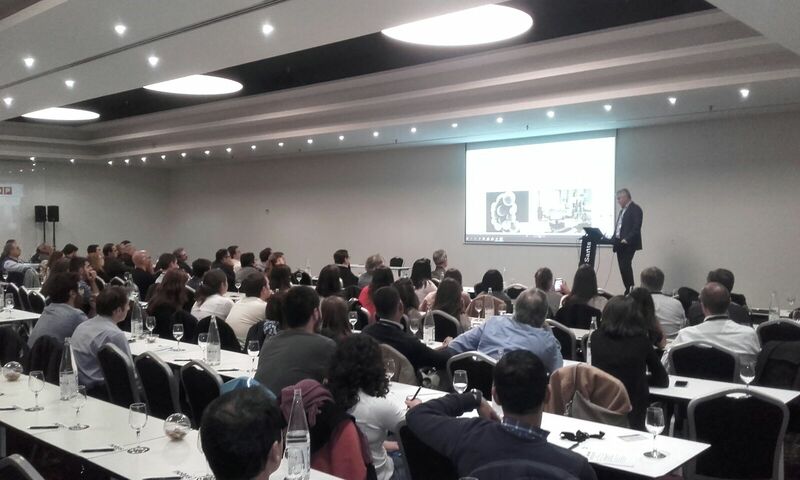 Jesús Izco, Coordinator of NANBIOSIS, has presented NANBIOSIS-ICTS at the XI annual Conference of CIBEREHD, which takes place from 27 to 28 November 2017 at the Hotel Barceló Sants in Barcelona. Jesús Izco has explained the opportunities offered by the ICTS NANBIOSIS as a Platform for Research and Biomedical Innovation, giving examples of private-public collaboration in competitive calls in which NANBIOSIS has participated and explaining the design of the new Nanomedicine Cascade Characterization Service, in which NANBIOSIS is working on. P1. Mechanisms of liver damage/evolution into advanced cirrhosis and transplant. P2. Gastrointestinal physiopathology: inflammatory illness and motility disorders. P3. Epidemiology, prevention and treatment of viral hepatitis infection. Encapsulation of magnetic nanoparticles (MNP) into PLGA nanoparticles has been achieved by nano-emulsion templating using for the first time both, a low-energy emulsification method as well as biocompatible components accepted for pharmaceuticals intended for human use. 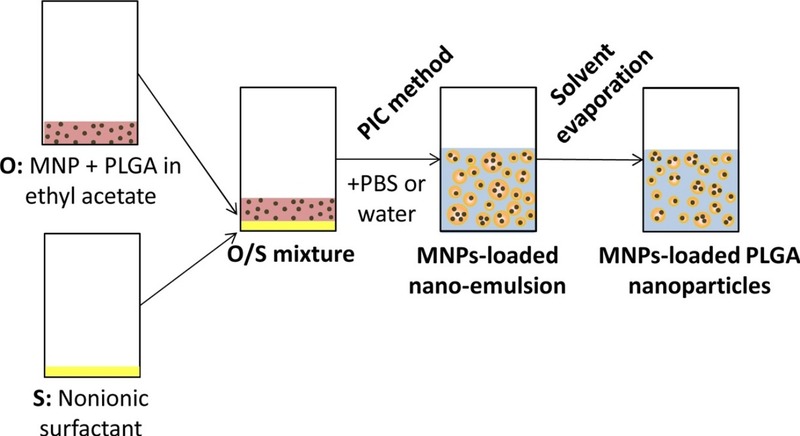 The incorporation of MNP by nano-emulsion templating method proposed in this work has been investigated in two different systems applying mild process conditions and is shown to be simple and versatile, providing stable MNP-loaded PLGA nanoparticles with tunable size and MNP concentration. MNP-loaded PLGA nanoparticles showed sizes below 200 nm by DLS and 50 nm by TEM, and mean MNP loading per PLGA nanoparticle of 1 to 4, depending on the nanoparticle dispersion composition. Physical-chemical features suggest that the MNP-loaded PLGA nanoparticles obtained are good candidates for intravenous or intratumoral administration. The equipment of Dynamic Light Scattering (Dynamic Light Scattering) of NANBIOSIS Unit 12 has been used to determine the size distribution of polymer particles and Microscopy with Hyperspectral Analysis (Hyperspectral enhanced dark field microscopy) to detect the encapsulation of magnetic nanoparticles in polymer particles. Graphical abstract: Schematic representation of the preparation process of Fe3O4 MHighlightsN P-loaded PLGA nanoparticles by nano-emulsion templating. Unit 1 of NANBIOSIS, Protein Production Platform (PPP) and the Nanobiotechnology research group of CIBER-BBN in collaboration with the Universidade Estadual de Campinas and the Universidade de São Paulo have recently published, in the European Journal of Pharmaceutical Sciences, the results of the research devoted to the improvement of protein-only based nanoconjugates for gene therapy. The evaluated gene-therapy vehicle prototype displayed a similar transfection efficiency to that of the commercial vector LipofectamineTM 2000. 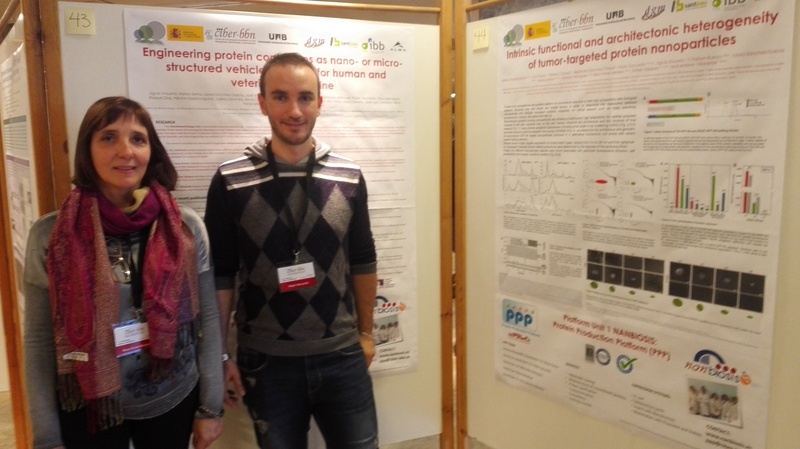 The research group coordinating NANBIOSIS Unit 13 is the Spanish group of the European project ORCHID (Organ-On-Chip In Development). The scientists of Engineering Research Institute (I3A) and CIBER-BBN, Luis Fernández and Iñaki Ochoa, will work on this project whose objective is to accelerate the social and economic impact of the technology known as Organ-on-Chip. This technology based on the use of microfluidic platforms is already facilitating the discovery of drugs, but it can go a step further with applications in personalized medicine and safety pharmacology and that, in addition, offers alternatives to conventional tests in animals. The mechanical properties and research ability of the microfluidic platforms will be tested in NANBIOSIS unit U13 Tissue and Scaffold Characterization. The project that will take place over two years, is led by the Medical Center of the University of Leiden and the Dutch consortium Organ-on-Chip hDMT and participated by entities and research centers from four other countries, Germany, Belgium, France and the Netherlands. The consortium that has the financial support of the European Union with half a million euros, will work to facilitate and accelerate the development of prototypes, validated cellular systems that mimic sick or healthy human tissue and the implementation of this technology by a broad group of potential users in science, health care and industry. This platform will provide an overview and updates so that users can easily track progress, consult developers directly and identify gaps in current knowledge, which limits implementation. It will also address ethical and regulatory issues, particularly with regard to personalized information, the economic and social impact, the training of researchers and the design of a R & D “roadmap”. Likewise, the construction of an infrastructure is planned so that scientists, policy makers, financiers and end users can join the decision-making processes that will guide future European developments in Organ-on-Chip applications. Among its actions is the establishment of a digital platform that allows the exchange of knowledge between researchers and representatives of private corporations, including insurance companies, pharmaceutical and biotechnology companies, the food industry, health foundations and patient organizations. Engineering protein complexes as nano- or micro-structured vehicles or drugs for human and veterinary medicine. Ugutz Unzueta, Naroa Serna, Laura Sánchez-García, José Vicente Carratalá, Olivia Cano-Garrido, Mercedes Márquez, Paolo Saccardo, Rosa Mendoza, Raquel Díaz, Héctor, López-Laguna, Julieta Sánchez, Anna Obando, Amanda Muñoz, Andrés Cisneros, Eric Voltà, Aida Carreño, José Luis Corchero, Neus Ferrer-Miralles, Esther Vázquez, Antonio Villaverde. Intrinsic functional and architectonic heterogeneity of tumor-targeted protein nanoparticles. Mireia Pesarrodona, Eva Crosa, Rafael Cubarsi, Alejandro Sanchez-Chardi, Paolo Saccardo, Ugutz Unzueta, Fabian Rueda, Laura Sanchez-Garcia, Naroa Serna, Ramón Mangues, Neus Ferrer Miralles, Esther Vázquez, Antonio Villaverde. Synthesis of different length monodisperse COL-PEG-PEPTIDE to increase biodisponibility of multifunctional nanovesicles for Fabry’s desease. Edgar Cristóbal-Lecina; Daniel Pulido; Solène Passemard; Elizabet González-Mira; Jaume Veciana; Nora Ventosa; Simó Schwartz; Ibane Abasolo; Fernando Albericio and Miriam Royo. Preclinical behavior of medium-chain cyanoacrylate glue with two different surgical application forms for mesh fixation in abdominal wall repair. Gemma Pascual, Bárbara Pérez-Köhler, Marta Rodríguez, Claudia Mesa-Ciller, Ángel Ortillés, Estefanía Peña, Begoña Calvo, Juan M. Bellón. Inspiration and Expiration Dynamics in Acute Emotional Stress Assessment. Javier Milagro, Eduardo Gil, Jorge M. Garzón-Rey, Jordi Aguiló, Raquel Bailón. Poly-DL-lactic acid films functionalized with collagen IV as carrier substrata for corneal epithelial stem cells. Ana de la Mata, Miguel Ángel Mateos-Timoneda, Teresa Nieto-Miguel, Sara Galindo, Marina López-Paniagua, Xavier Puñet, Elisabeth Engel, Margarita Calonge. Strategy for engineering myoglobin nano-traps for biomedical sensing technology. E. Laukhina, O. V. Sinitsyna, N. K. Davydova, V. N. Sergeev, A. Gomez, I. Ratera, C. Blázquez Bondia, J. Paradowska, X. Rodriguez, J. Guasch, Jaume Veciana. Bioreceptors nanostructuration study for early detection of Alzheimer. José Marrugo, Dr. Samuel Dulay, Dr. Mònica Mir, Prof. Josep Samitier. RGD dendrimer-based nanopatterns promote chondrogenesis and intercellular communication for cartilage regeneration. Ignasi Casanellas, Anna Lagunas, Iro Tsintzou, Yolanda Vida, Daniel Collado, Ezequiel Pérez-Inestrosa, Cristina Rodríguez, Joana Magalhães, José A. Andrades, José Becerra, Josep Samitier. Long-range electron transfer between redox partner proteins. Anna Lagunas, Alejandra GuerraCastellano, Alba Nin-Hill, Irene Díaz-Moreno, Miguel A. De la Rosa, Josep Samitier, Carme Rovira, Pau Gorostiza. Miniaturized multi-sensing platform for pH and Dissolved Oxygen monitoring in Organ-On-aChip systems. M. Zea, A. Moya, I. Gimenez, R. Villa, G. Gabriel. Electrochemical characterization of SWCNTs based microelectrodes fabricated by inkjet printing. M. Mass, A. Moya, G. Longinotti, M. Zea, M. Muñoz, E. Ramon, L. Fraigi, R. Villa, G. Ybarra, G. Gabriel. 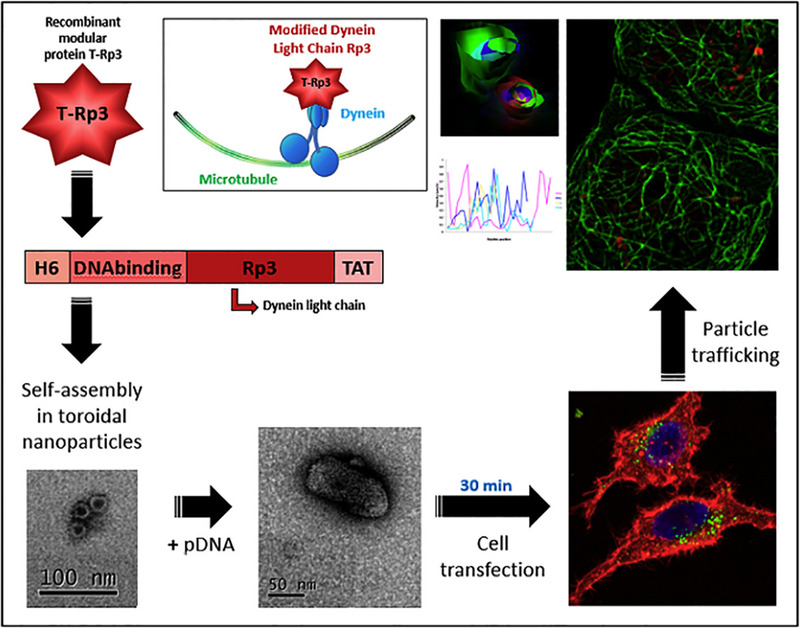 In vivo imaging and local persistance of polymeric micro- and nanomaterials labelled with the near infrared dye IR820. Isabel Ortiz de Solórzano, Gracia Mendoza, Inmaculada Pintre, Sara García-Salinas, Víctor Sebastián, Vanesa Andreu, Marina Gimeno, Manuel Arruebo. Perfluorocarbon-loaded Nanocapsules from Nano-emulsion Templates as Microbubble Precursors for Biomedical Applications. G. Calderó, A. González, M. Monge, C. Rodríguez-Abreu, M.J.García-Celma, C. Solans. Biodistribution study of polymeric drug-loaded nanoparticles in murine model. Marta Monge, Aurora Dols, Stephane Fourcade, Aurora Pujol, Carlos Rodríguez-Abreu, Conxita Solans. Behavior and a comparative study between tantalum and titanium alloy implant surfaces against bacterial adhesion. M.A. Pacha-Olivenza, M.L. González-Martín. Bacterial adhesion on calcium ion-modified titanium implant surfaces. M.A. Pacha Olivenza, R. Tejero, M. Delgado-Rastrollo, M.L. González-Martín. Bioactive coatings to promote tissue regeneration and ingrowth into 3D custom-made porous titanium endoimplants (COATREG-3D). Santos-Ruiz L; Granados JF; Ruiz F; Yáñez JI; González A; Cabeza N; Vida Y; Pérez-Inestrosa E; Izquierdo-Barba I; Vallet-Regí M; Rubio J; Orgaz F; Rubio N; González ML; Peris JL; Monopoli D; Becerra J.
Subcutaneous implantation of a biodegradable apatite/agarose scaffold: biocompatibility and osteogenesis characterization in a rat model. Natalio García-Honduvilla, Gemma Pascual, Miguel A. Ortega, Alejandro Coca, Cynthia Trejo, Jesús Román, Juan Peña, María V. Cabañas, Julia Buján, and María Vallet-Regí. Dual T1/T2 NCP-based novel contrast agents for brain tumor MRI: a preclinical study. Suarez, S; Arias-Ramos, N; Candiota, AP; Lorenzo, J; Ruiz-Molina, D; Arús, C; Novio, F.
Metronomic treatment in immunocompetent preclinical GL261 glioblastoma: effects of cyclophosphamide and temozolomide. Ferrer-Font, L; Arias-Ramos, N; Lope-Piedrafita, S; Julià- Sapé, M; Pumarola, M; Arús, C; Candiota, AP. Gated nanodevices for innovative medical therapies. Maria Alfonso, Irene Galiana, Beatriz Lozano, Borja Diaz de Greñu, Cristina de la Torre, Andrea Bernardos, Sameh El Sayed, Daniel MuñozEspin, Miguel Rovira, José Ramón Murguía, Manuel Serrano, Ramón Martínez-Máñez. NANOPROBE: Gated sensing materials and devices for the detection of infectious diseases and urological cancer. Ángela Ribes, Luís Pla, Sara Santiago-Felipe, Alba Loras-Monfort, M.Carmen Martínez-Bisbal, Elena Aznar, Guillermo Quintás-Soriano, José Luis Ruiz-Cerdá, María Angeles. 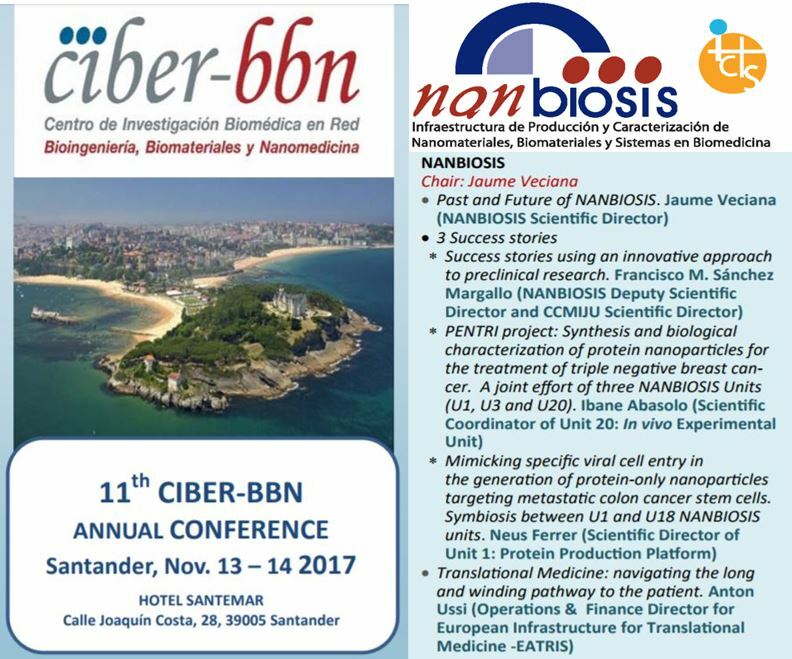 CIBER-BBN will celebrate its 11th Annual Conference on November 13 and 14 in Santander. In these conference there will be a session dedicated to NANBIOSIS. Likewise, the annual meeting of the Scientific Technical Advisory Committee of NANBIOSIS will take place. As in previous occasions, the meeting will serve to know the activity of NANBIOSIS, the Singular Technical Scientific Infrastructure (ICTS) of the CIBER-BBN and the Minimally Invasive Surgery Center Jesus Usón for the production and characterization of biomaterials, nanomaterials and devices up to its preclinical validation. As a novelty, it will be presented at the conference, the new internal structure, generated by NANBIOSIS for the development of “turnkey” projects in which, taking advantage of the complementarity and experience of its Units, NANBIOSIS offers complete service packages, with added value, adapted to the client’s needs, for applications such as nanotherapeutic agents, regenerative medicine, medical and diagnostic devices, among others. Some of the packages that are already designed or in more advanced stages will be explained, among which stands out the service of characterization and cascade assessment of nanomaterials that includes the characterization of the physicochemical attributes, their biological properties in vitro (immunology, toxicology and efficacy), and its in vivo compatibility (immunology, toxicology and efficacy), using appropriate animal models, with the possibility of being subject to regulatory conditions of Good Laboratory Practices. Some success stories of these “turnkey” projects developed in NANBIOSIS will be shown. On this occasion, in addition, it is planned a presentation of EATRIS , the European Infrastructure for the Translation of Medicine, with which NANBIOSIS has initiated a line of collaboration. Since its launch in July 2015, NANBIOSIS has received more than 550 access requests through its website, with an average participation of some 80 competitive projects per year and with an annual income for its services of between 2 and 3 million euros. Among its users, there are more than 100 companies.